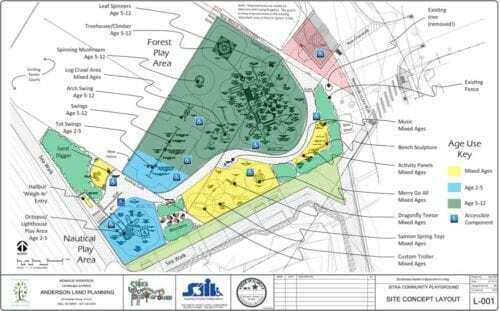 The proponents of a new playground at Sitka’s Crescent Harbor took their plans to the Chamber of Commerce recently (10-19-16) in hopes of winning support for the project. They’d like to get to work on the over half-million dollar upgrade in 2017. 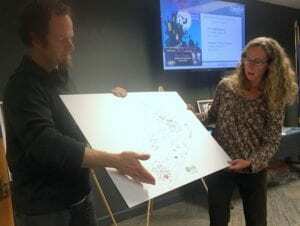 Learn more about the Sitka Community Playground project here. The Crescent Harbor playground has been around since the development of the boat harbor and the Centennial Building in the late 60s. Playground advocate Bridget Hitchcock peered around the room for someone in their forties or fifties who played on the original equipment. She didn’t have to look far. That was chamber director Rachel Roy. The gravel-surfaced playground, with its old swingsets and jungle gym is the last of its kind. Hitchcock said that only her group’s interest in an upgrade has held off closure. Two other public playgrounds at Moller Field have been closed, Hitchcock said, due to liabilities that this new redesign is hoping to address: accessibility and safety. Dave Neutzel, with Southeast Alaska Independent Living, is sponsoring the project. SAIL is all about giving people with disabilities improved access to their world. He said that SAIL didn’t see a reason to go piecemeal with a playground redesign. The pair played a video with a walk-thru of a digital rendering of the design, done by local landscape architect Monique Anderson. Nothing about the layout shouted accessibility. It’s supposed to be a playspace that opens up the imagination. The color scheme is created through the use of hard rubber tiles over asphalt. The surface is rideable, which will be appreciated by kids who often try out their first training wheels on the tennis courts next door. One of those courts would be sacrificed to expand the playground, but Hitchcock said that rarely is there more than one court in use. Further public meetings are scheduled to make sure that residents buy into the plan. But will anybody else? The price tag for the project is $570,000 — on the low end. The group has only raised about $37,000. Hitchcock admitted that there was a way to go. The playground has been endorsed twice by the Sitka Community Health Summit. An effort in 2011 petered out. This one — given the green light by last year’s summit — has considerable momentum. In fact, Hitchcock and Neutzel were optimistic. Hitchcock told the chamber that she hopes to have “a barn raising” for the playground in 2017.